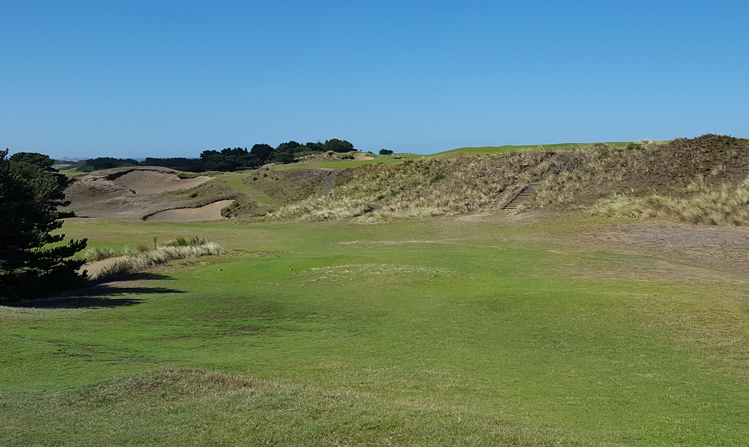 Pacific Dunes Hole 1: The first hole is relatively docile, although even the "generous" opening fairway doesn't feel that wide if the player has first tee jitters. However, it is not long and the green is relatively wide open. Pacific Dunes Hole 2: The stunning visual nature of the golf course begins on this short par 4 with trouble in the form of natural and not so natural hazards abound. The green is heavily sloped and difficult to get up and down from anywhere should the player miss it. Pacific Dunes Hole 3: This short par 5 is reachable in two, but those two shots must avoid the multiple layers of bunkers, gorse and other goodies that will turn a good score into a bad one really quickly. 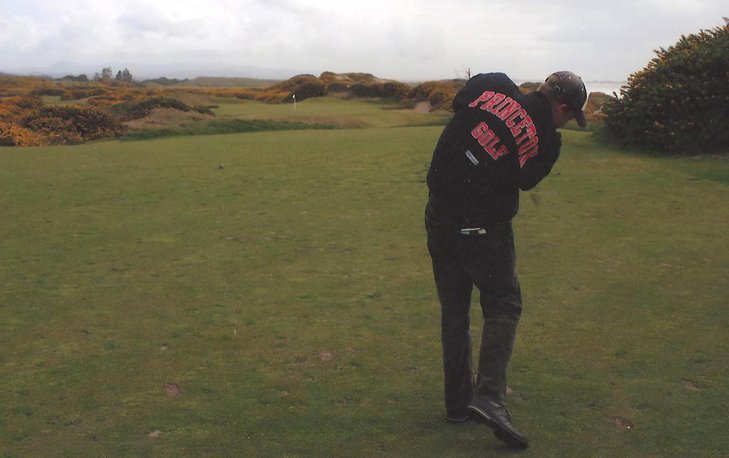 The back right pin placement is most perilous The ocean views on this hole are outstanding. 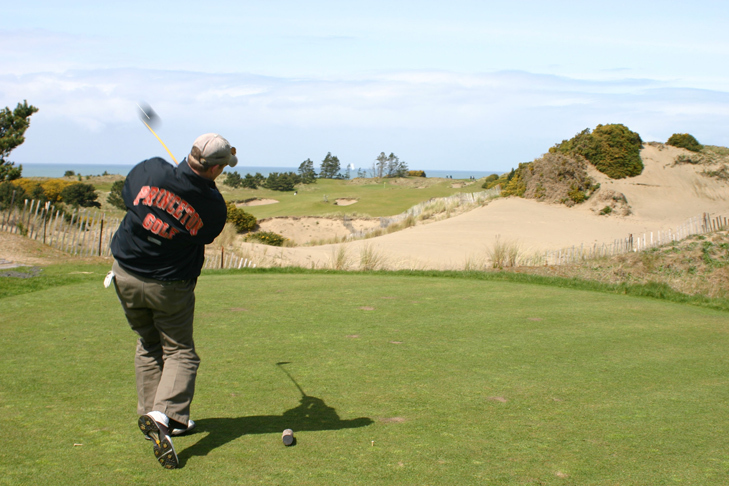 Pacific Dunes Hole 4: This is possibly the most difficult golf hole in the world, when it plays into the wind. This beast runs along a gorse filled cliff on the right side. 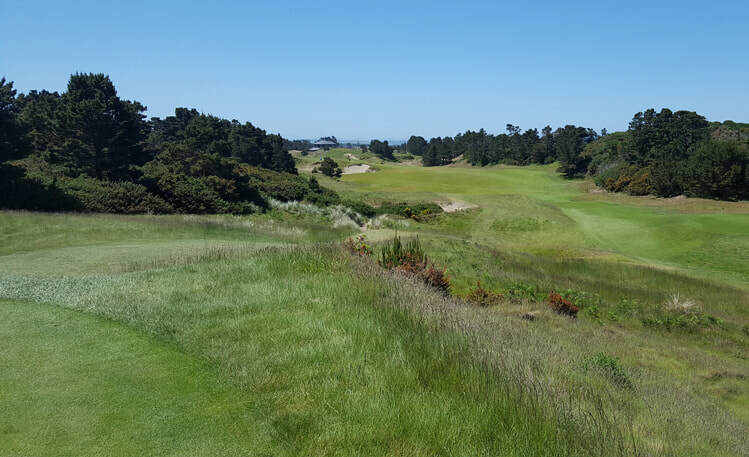 The left is riddled with bunkers and worse penalties in the form of gorse-filled areas, and the margin for error on the tee shot is minuscule The green is narrow and nestled between a large dune left and ocean cliff right and approaches from the left are scary indeed. 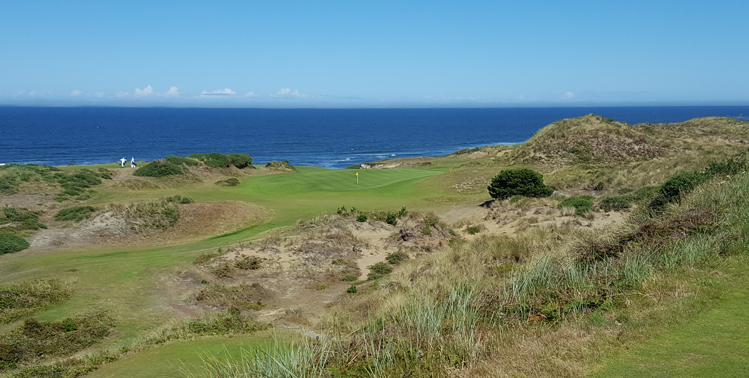 Pacific Dunes Hole 6: At just over 300 yards, the sixth hole might entice the golfer into thinking that they’re getting a break. This just isn’t true. The drive must be placed on the right side of the fairway if there is to be any chance of holding this very, very tiny green with steep, shaved grass slopes running down from it on all sides. More than that, the 30 foot deep bunker front left must be avoided if par is even going to be considered a viable option. Pacific Dunes Hole 7: Mean to its core, this long par four wakes the golfer up with their first tee shot between trees for the day (and one of the few). The second shot has to find its way over, around or through bunkers and little nobs of thick grasses to an undulating green that seemingly has drop offs to tough chips on all sides. 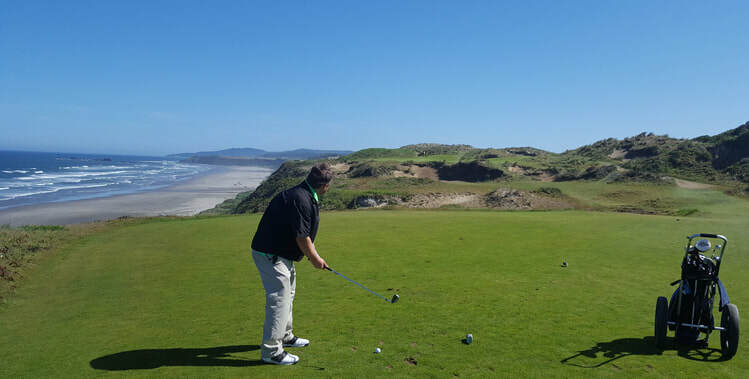 Pacific Dunes Hole 9: This golf hole is great, in a bizarre sort of way. It features two greens: one on the right, perched above a hillside on its left and the left green, nestled at the bottom of the valley below that hillside. The drive is nearly blind, up a hill with deep bunkers cut into it. The safe shot is right, which will leave an enormously long approach to either green, but is death for the left green. The farther left the drive goes, the shorter the shot and better angle for the left green (but worse for the right). Pacific Dunes Hole 10: The first of two consecutive par threes is downhill to a green with only natural contours defending it. However, the dunes left and right are not out of the question for a wayward shot. 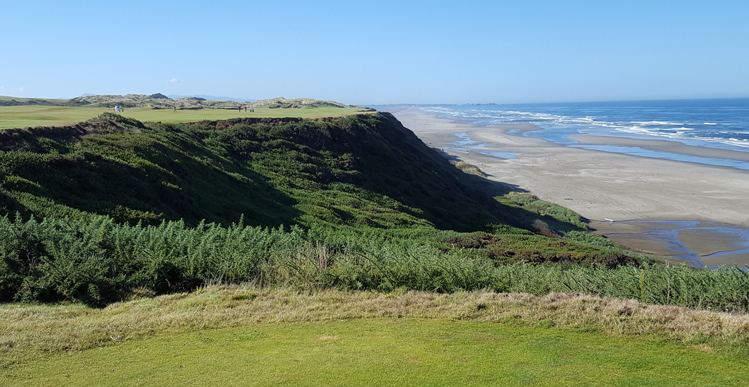 Pacific Dunes Hole 11: At less than 150 yards from all tees, one might be tempted to overlook the difficulty of this little beauty, but peril is everywhere. From the obvious cliffs to the left and high dunes right, any lateral miss will almost guarantee bogey or worse. However, the tiny green also requires perfect distance control to avoid long grasses both short and long. Simply putt, just don't miss, but enjoy the views. Pacific Dunes Hole 13: The signature golf hole on this course is a long par four that runs between the ocean cliffs and enormous and beautiful sand dunes to the right. The approach to the green leaves little room for error and the golfer must keep his concentration as the views are fantastic. Pacific Dunes Hole 14: This short par 3 has a nice view of the rest of the inland holes but the golfer must hit the green as short left and right are all downhill slopes and ugly-looking bunker shots that will all but erase an easy par. Pacific Dunes Hole 17: The last par three of the day is a redan hole of sorts, but from an elevated tee. The player must not flirt with the bunker to the left as it is very deep with a long lip that will embed most shots that find it. Going a little right is ok, but too far and the player will find more sand, trees and gorse if they hit it too long, which is obviously bad. 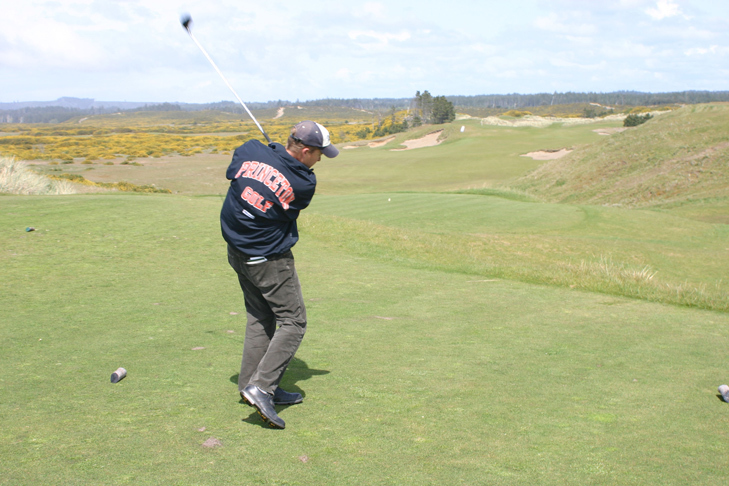 Pacific Dunes Hole 18: The final hole is an uphill par five (even though the tee shot plays downhill a little bit). There are deep bunkers on each side of the hole all the way to the green, which slopes mostly from left to right.